​To all new moms and moms to be…here’s one cold fact that nobody has ever told you: NOT all detergents are suitable for cleaning your baby’s clothes. You might argue that any detergent will clean the clothes. Yes, that’s what any soap does. But when you prioritize your kid’s health and well-being, you’ll realize the need to only use detergents that are 100% safe and gentle on their sensitive skin. Otherwise, your baby will soon develop skin irritations, allergy outbreaks- to name but a few.That said, I’m here to help you select the best baby laundry detergent for washing your kid’s clothes. ​Why Use A Baby Safe Detergent? ​If you have a baby, I suggest that you start washing their clothes with a baby safe detergent right now. 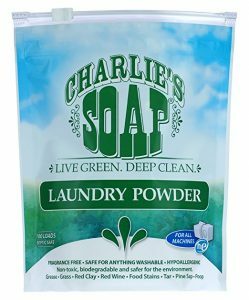 ​Starting our list of the most popular baby detergents on the market today is the Charlie’s Soap – Fragrance Free Laundry Powder. Available in powder form, this is a 100% effective detergent at cleaning your baby’s clothes and removing all the tough stains that other soaps have difficulties removing. One thing that qualifies this soap for use in cleaning baby’s clothes is its non-toxic nature. It does not contain any brighteners or fragrances. This makes it a non-toxic, non-irritating product that will not have any effects on your kid’s skin. Besides, it’s biodegradable, making it safe for the environment. It’s not a surprise that most diaper manufacturers actually recommend you to clean their diapers with this detergent.Going through the package details, you’ll note that it comes with a minimum of 100 loads from its container. In my honest opinion, this is a great deal- especially when you consider the fact that you’ll be using it to clean your baby clothes only. Don’t forget that this soap is easy on children clothes and they’ll last longer compared to those washed using other soaps out there. 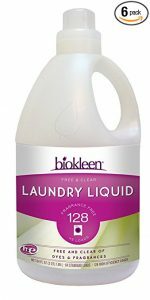 ​Next on the list, we have the Biokleen Laundry Liquid. Unlike the previous product, this detergent comes in liquid form. It has won a spot on our list because it is 100% free from chemicals, dyes, and fragrances. This makes it gentle on your baby’s skin while doing its job perfectly well.One thing you’ll love about this soap is that it is a plant-based product. It’s made using the grapefruit seeds (no scent) extracts and surfactants which enables it to effortlessly get rid of stains on your child’s clothes while leaving no odors behind. Even more amazing, it doesn’t any harsh perfumes and residues on your fabrics that might get quickly absorbed into your kid’s sensitive skin and cause skin problems. This detergent will also see you through many rounds of laundry. It comes in a huge 64 ounces container. Assuming that you’re only using it to clean children clothes- and you do it about four times every week, a single package will likely last for about two months. ​Dreft- a brand with over 80 years of experience in the industry and thousands of recommendations from expert pediatricians. 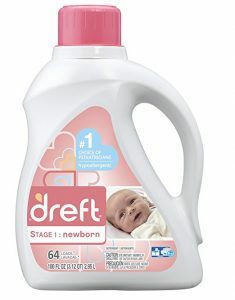 One of their top products, the Dreft Stage 1: Newborn Hypoallergenic Liquid Baby Laundry Detergent, enjoys an extensive usage the world over for its effectiveness at reducing exposure of your baby’s sensitive skin to the harmful chemicals that might result in sensitives or allergies. The best thing about this liquid formula is that it was developed with your newborn baby in mind- where Dreft fully understands that they’ve got different skin needs than those of adults. It is hypoallergenic, making it ideal for babies suffering from allergies and sensitives. It is also free of dies for extra safety. It also comes with a light scent and has been clinically tested to prove its effectiveness.Unlike its rivals, this soap can clean a wide range of fabrics- including cloth diapers made from cotton and poly/cotton blend. Keep in mind that it works with both standard and high efficiency washing machines. 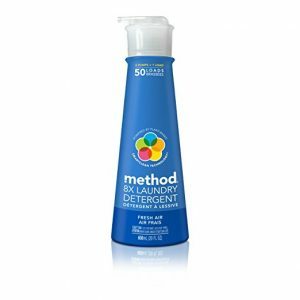 ​Method Naturally Derived 8X Concentrated Laundry Detergent comes with a unique packaging for easy, hassle-free use. It comes packed in a convenient pump bottle that provides with up to 75 loads of laundry for extended use.One thing that puts this soap on the map is the Method’s smart cleaning technology it comes with. This does an excellent job at getting rid of the stubborn stains on your newborns’ clothes while giving them a fresh aroma. The convenient pump bottle design makes it extremely easy to use- with no mess and reduced spillage and wastage. The fact that it comes highly concentrates means you only need to use a smaller amount to enjoy its maximum cleaning power.For the environment-conscious moms, you’ve got nothing to worry about because this soap is made from plant-based ingredients that are safe for the environment. Also, it’s safe for use with HE machines. And because of its smaller size, it won’t take up large spaces as the big bottle liquid detergents do. 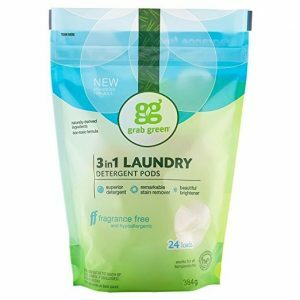 ​If you’re looking for the best baby laundry pods to clean all your baby’s clothes, say hello to the Grab Green Natural 3-in-1 Laundry Detergent Pods. This soap ranks among the safest, naturally derived (minerals and plants based) soaps on the market today. And being a 3-in-1 formula, these pods will thoroughly do the cleaning, remove big stains, and make your clothes brighter than ever before. The unique formula of this pack of pods comprises of the following: phosphate, chlorine/dye-free, and optical brighteners. All these make it an all-natural soap that works at all temperatures to give you an effective cleaning without leaving behind any residue or harsh and smelly chemicals or carcinogens that can negatively affect your kids’ health (skin). Because it comes in pods form, you’ll have an easy time determine the right amount to use for a given washing. However, I recommend keeping this soap off the kids and not using it to clean clothes for children under six years old. This is because it looks attractive to them and they might ingest it and get poisoned.The biodegradable formula is also a way to show your love for the environment. It’s formulated to work with both the standard and high efficiency machines, unlike most of the soaps out there. ​Here’s another excellent treat for your newborns’ clothes…the Eco-Me Natural Concentrated Liquid Laundry Detergent is an all-natural liquid detergent made from plant-based ingredients. These are not only effective in the cleaning job but also easy on your baby’s skin.While this soap easily and quickly removes the tiny little spit up stains as well as occasional food spills or dribble on your children clothes, it might take longer to remove heavy duty soils and other gross stuff. Nevertheless, I can assure you that it does the job pretty well. Packed in a 32 ounces ball, you’ll enjoy up to 60 washes with this soap. Moreover, it has a high concentration, so just a small drab will do for a single load. Another thing that makes this detergent a top choice for most moms is lack of synthetic fragrances. This makes it even better for the sensitive skin of your kiddo as it ensures the clothes come out odorless and safe for them to wear. On top of all this, this soap is eco-friendly, so buying it shows you care for the environment too. 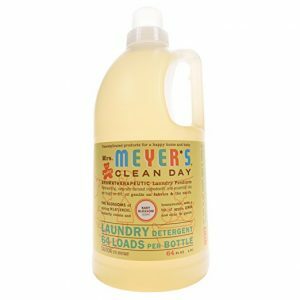 ​As we approach the end of our list of the top-rated detergents for baby laundry, allow me to introduce you to Mrs. Meyer’s Clean Day 2x HE Liquid Laundry. This is a hardworking liquid soap that comes fully concentrated, not to forget that it is fully safe and natural. It effectively cleans your baby clothes while kicking off the toughest of the stains. Moms also love this detergent because of its softness plus the scent of delicate blossoms it comes with. Unlike most soaps out there, this dermatologist-tested to ensure it has no effects on your baby’s skin. With up to 97% natural ingredients, the liquid formula comes filled with a handful of special anti-stain enzymes, surfactants, among other top components. All these unite to remove all the grime, dirt and residue which is sure to irritate your baby’s skin if left behind. It’s also interesting to note that this baby’s detergent comes packed in an environmental-friendly bottle- good news for all moms who want to make their surroundings safe and better! Moms who have used this soap before have reported excellent results when they wash the colored clothing as they become brighter than before- as in, the white gets whiter. 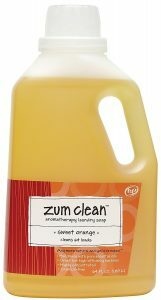 ​Last, but definitely not the least, we have the Zum Clean Aromatherapy Laundry Soap. Just like all the other detergents that made it to this list, this soap is also safe for your baby’s skin- with no chemicals, synthetic foaming agents, and other artificial stuff. Even more interesting, all the ingredients used to make this soap are natural! These include the coconut oil, vegetable glycerin, natural borax, baking soda, and 100% pure essential oils. These are proven ingredients that effectively kicks off the tough stains from your child’s clothes while making them look cleaner and brighter. The low-suding laundry soap also comes highly concerted- meaning you only need to use smaller amounts to get the best results. This soap is also made for use with the high-efficiency machines. It comes with sweet orange colors and is packed in a 64 oz. bottle. You can enjoy up to 32 loads for the top loading washers and up to 64 loads for the high efficiency machines. 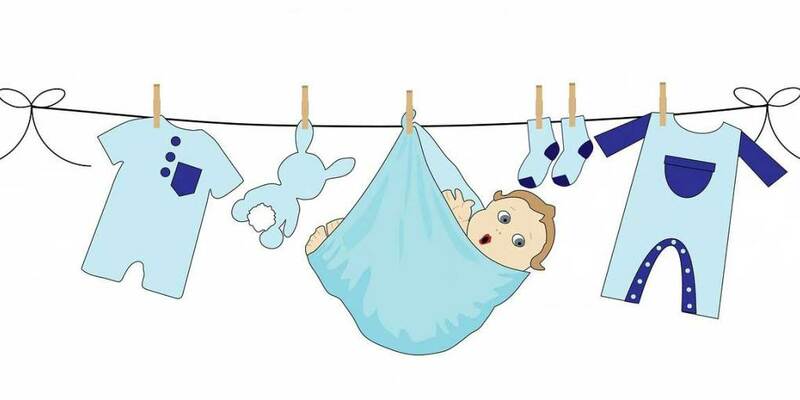 ​What To Look For When Buying Baby Laundry? ​The first and most important thing to look for a baby laundry detergent is its ingredients.ONLY go for products that are 100% free of dyes, chemicals, and fragrances as these are the main culprits of the irritants that affect our child skin. Keep in mind that dyes and fragrances do not add any cleaning efficiency to your detergent; they only add some pleasing aroma or give the detergent an appealing color. ​Next, you should ensure that you buy a detergent that does it intended job perfectly well.Look for a detergent that has a high reputation for effortlessly removing the frustrating stains on baby’s clothes. ​If you care about your surroundings, you’d also want to look for a plant-based detergent. This will not only be safe on your kid’s skin (its natural), but it will also reduce the risks associated with the synthetic products. ​As I’ll show you later in this post, there exist three main types of detergent on the market today- liquid, powder and packs or pods. Out of these three, it’s recommended that you go with the liquid and powder products for cleaning your baby’s clothes- based on your personal choice. The powder type has excellent performance while the liquid is less bulky since you can ultra-concentrate it. Pods, however, should be avoided at all costs to their many, recent safety concerns for children as young as below six years. ​This is doubtlessly the most popular type of detergent for moms all over the world. It usually comes packed in a bottle and a spout that you use to pour the detergent. A plastic cup comes with the package to help you easily measure the correct amount of detergent to use. The extremely easy to use detergent does an excellent job at removing greasy stains. It’s also great for pre-treating.But it has a few drawbacks- e.g., it is messy, bulky, and not environmental friendly. ​The second type of baby laundry detergent revolves around the powder products. This type usually comes packed in a cardboard box alongside a scoop for efficiently fetching the powder. Most moms love it because it’s cheap, highly effective at removing stains, works with hard water, and comes in an environmental-friendly packaging.However, it’s messy and hard to pre-treat. ​Packs, commonly known as pods, refer to pre-measured portions of baby detergent that you can directly toss into your washing machine before adding the clothes. Because pods come pre-measured, it leaves very little or no room for error. What’s more, it’s highly efficient, convenient, and portable.Unluckily, it’s highly priced and attractive to babies with its small and colorful looks (causing poison risks). ​NOTE: Experts recommend against using packs for moms with children under six years old, as most of these kids have ingested these soaps and ended up getting poisoned. ​Develop a habit of washing the clothes as soon as you buy them. Unknown to many moms, most of the new clothes come with the formaldehyde coating to prevent them from getting wrinkled when being shipped. This can have adverse effects on your child’s skin if not cleaned. To easily remove the tough stains on your child’s clothes, it’s recommended that you immediately rinse the stains in cold water. This will prevent the stains from setting on the clothes. And if you note that a stain doesn’t come out after washing, don’t attempt to dry the cloth. Instead, “rewash” it by applying a stain treatment on that particular spot for better results. Running a cycle of vinegar solution through your washer and then wiping it clean can help remove the urine-like smell retained in your machine after washing your baby clothes. Try it today before doing the rest of your family clothes. So, that’s all you need to know about the best baby laundry detergent. As I have told you countless times in the above post, using a baby-safe detergent to clean your newborn’s clothes is highly recommended. Such soap comes with fewer harsh chemicals, dyes, and fragrances- keeping your child’s delicate skin free from complications such as skin itches and allergic reactions. By following my full buying guide above, you can easily and quickly find the right detergent that will efficiently clean your small one’s clothes without affecting their well-being. Also, you can go through my list of the best detergents for baby laundry on the market today and pick one that matches your needs and expectations. Happy cleaning of your baby’s clothes!